This is what my best friend gave me for my birthday. It was so fun! The best part is that she was here!!! Twice a week I go to Zumba at the church. It's SUPER fun and I love it! The other days of the week I walk because it is the only thing that keeps my back from hurting. (I know, boring. But relevant to the story.) So my friend, Julie, and I figured out that Zumba is fun but not so good at keeping the back pain down. So... we figured out if we WALK TO ZUMBA we can have fun and not hurt. Okay, one more bit of relevant information. Julie started babysitting a newborn a few months ago. Now the story. We were walking to Zumba and the baby, Conner, was fussy because he needed to burp. I offered to burp him while we walk because he was crying. So we were walking along the road and talking away. Somehow my foot twisted. I don't know if I stepped in a hole or stepped on the side of the asphalt or if I just tripped on myself. But because I was holding the chunky monkey, it threw off my balance. The next thing I know, I am falling forward and watching Conner's head plummet toward the asphalt. The only thought going through my head is, "SAVE THE BABY!" So I reached out and caught his head. We landed and everything was fine. Julie picked up Conner and he screamed for 5 seconds and then he was fine. I stood up and checked on Conner. Then I noticed a lady honking her horn. I looked over and the stroller was rolling down the street and it fell over. (Later I realized that she thought the baby was still in the stroller.) So we gathered up all of our stuff, put the baby back in the stroller and told all the people who had stopped (in traffic) that we were fine. We went into the church and I washed off in the bathroom and shed a few tears while I thanked Heavenly Father for protecting Conner. Then we did Zumba and it was great! I have some road rash on my right leg, elbow and the palm of my right hand. I will probably be hurting pretty good tomorrow but for now, I'm good. I've had a few hours to think and talk about this and here is what I have taken away from this experience. It is SO important to live our lives in a way that allows up to be worthy to have the spirit in our lives. I have very rarely had the spirit speak to me in an audible voice but I know that he did today. I know this because I struggle to give my kids basic directions because I'm old now (I just turned 35!) and I can't come up with words like "shelf" or "basket." When the pressure in on I can barely remember my name. Yet in the moment I was directed, very clearly, what to do. I'm pretty sure that if I had not been living my life the way I should, I would have been left to my own devices. Scary! It's easy to ask for the Lord's help when we are facing a huge trial or dealing with a tragedy. Do we remember to ask for his help on a daily basis for the small things? Recently the youth daily gem from lds.org said, "Little children, young people, and adults alike, please believe how very much your loving Heavenly Father wants to bless you. But because He will not infringe upon our agency, we must ask for His help. This is generally done through prayer. Prayer is one of the most precious gifts of God to man." (Elder J. Devn Cornish, "The Privilege of Prayer", General Conference, Oct. 2011) So, here is what I have been trying to do. Ask Heavenly Father for His help. It's that simple. I see it with my kids all the time. I try not to intervene when they are working on something until they ask for help. It is good for them to learn how to try and IT IS GOOD FOR THEM TO LEARN TO ASK FOR HELP! It is that exact same thing with me and my Heavenly Father. I am so grateful for His constant guidance and presence in my life! I am grateful for the spirit which helps me in SO many ways! And even though I'm starting to feel the pain of my fall, I'm thankful for the lesson I learned today. I KNOW my Heavenly Father loves me! So the favorite Christmas present for all the boys (including dad) was the R/C cars. That is what the boys did all day on Christmas and Jeff took them out to the beach last night and they found some mud. How is it that if there is a mud puddle anywhere within a 1 mile radius that boys will find it? I know it's a surprise but this year started out at the beach. It is hard to tell in this picture but the waves behind the boys are 30 foot waves! It was crazy. This beach is usually calm and it was like a washing machine, there was foam flying up into the air, it was so cool! I was lucky enough to need some dental work in February and my dentist is in New Mexico. So I got to take my little self to Silver City for a week. 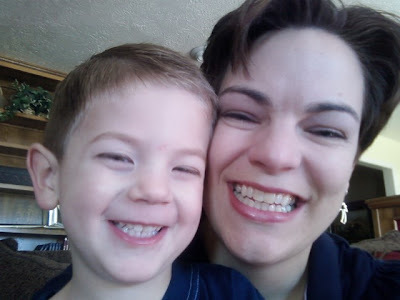 This is Lane, I am his "other mom" and boy how I miss him and his WHOLE family! I couldn't go to the mainland without a quick trip to see my parents. Jeff went to a Concrete conference in Vegas so we went from NM to NV together. My dad and I drove to the North Rim of the Grand Canyon. It is amazing! You can only get to this place on dirt roads with 4-wheel drive. Jeff's sister, Kirsten, and her family came to visit in February. Oh, we had so much fun. The kids are posing on the roots of trees that have been exposed by erosion. The beaches here are so sweet! I took this picture of my nieces and nephews while they were here and I just love it! Partly because I picked out their outfits while their mom was in Oahu and partly because they are just so DARN cute! Jeff's parents came over for part of Dave and Kirsten's trip and after Kirsten's family left, we had them all to ourselves for awhile. 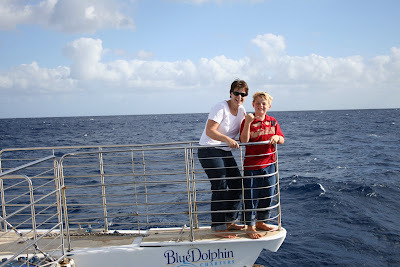 Jeffrey and I got to take a whale-watching trip with Grandma and Grandpa. It was pretty amazing. We saw lots of whales, I think I took about 500 pictures (and when I got home I realized that I need a telephoto lens.) But the trip was wonderful and I am so grateful for this fun memory with Jeffrey and his grandparents, he loved it. Late in 2007 we discovered a sink hole in our front yard. We had some problems with our septic system. It took us several months but we finally got it fixed. What a crazy mess. This is Jeffrey as Mr. Bucket in Willy Wonka, Jr. What a cutie! Grandma Lucy made it for the play and I think this is the only picture of Jeffrey in his oompa-loompa costume because he whipped that wig off so fast as soon as the play was over, he hated it! He was Mr. Bucket in the first act and an oompa-loompa in the second act. I think he had fun being an oompa until he saw the costume. Jackson won the Maui Poetry Peace Prize in April. He wrote a fabulous poem about Martin Luther King, Jr.
Each spring, Kalaheo school puts on a May Day Performance and each grade performs a cultural dance they have spent months learning and perfecting. Jackson with his mini ipu. Jeffrey's class did a really cool stick dance. And last but not least, Kevin. 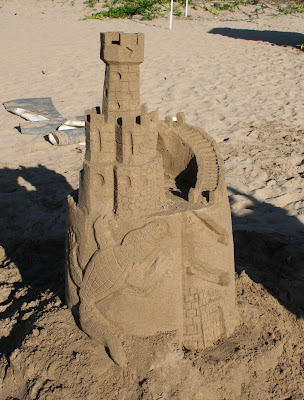 It's rare but occasionally the castles don't make it through the carving process. Jeff swears that he had too much help on this one. 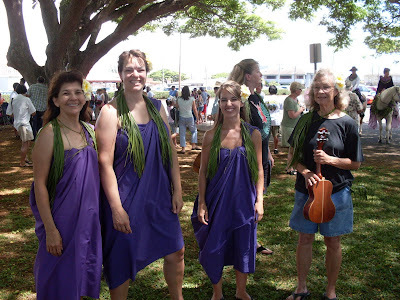 This is me with some of my hula sisters in the King Kamehameha Day Parade. Sadly, I am taking a break from hula right now. It turned out to be too hard with seminary. I will get back to it someday. I really miss it and my hula sisters. 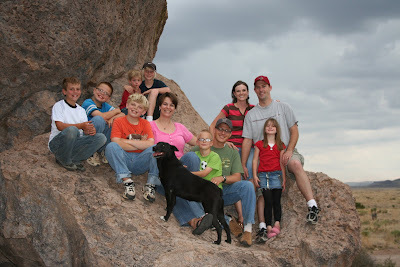 When we asked our kids what they wanted to do on vacation this summer, they said, "City of Rocks!" So we headed off to New Mexico. We stayed with our dear friends for a week and it was a blast! 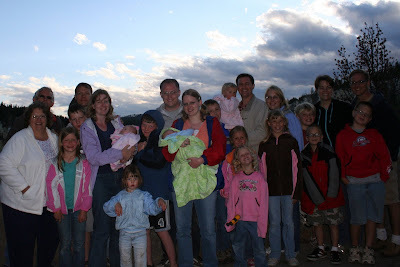 After New Mexico, we were able to meet Jeff's family in Yellowstone for a reunion. It was so fun. We haven't seen Eric for several years and we had a great time at the cabin. The kids didn't even want to go into the park, they just wanted to play with their cousins in the loft. This vacation turned out to be epic. I logged 4,500 miles on the rental car (not exaggerating.) We were in 10 states in a month. It was insane - and fun. This is another one of Jeff's castles. I love the dragon on the side. Our good friends from the U of U came to see us in September. 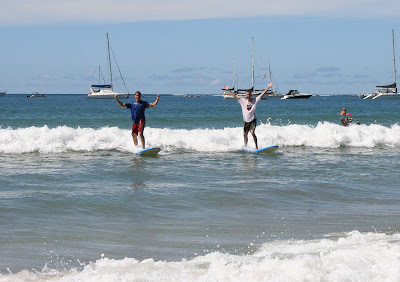 This is Jeff and Danny on the surfboards. Unfortunately, no one was taking pictures when Kiersten and I stood up! The Lai'e temple is closed for remodeling right now so Jeff and I headed to Kona for a temple trip. Lucky for us, Kona has PHENOMENAL diving. The clarity of the water is unbelievable over there. My mom met us in Kona and we had a little mother-daughter weekend. It was pretty cool. 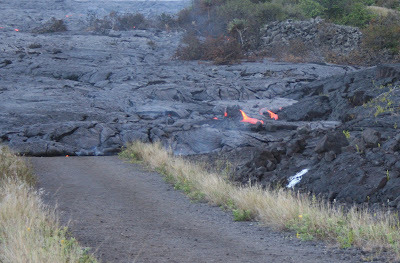 We even got to see some lava flowing. When we got back to Kauai, we sat at the kitchen table for a week and made chunky watches. It's hard to tell which was more fun. 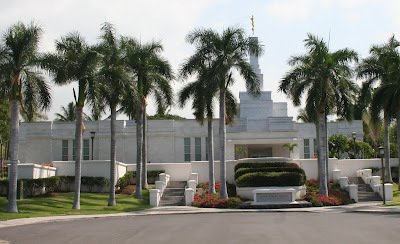 It is so fun to have the opportunity to visit all of these amazing temples. But it definitely makes us realize how much we took it for granted being close in the past. Jeffrey was growing his hair out for a while. Just about the time when mom and dad couldn't handle it anymore, he decided that he wanted to have a mohawk for Halloween. So we put up with it for a few more months. It was so funny because I was on the big Island with my mom when Jeff did this. I got home and I was so relieved to be able to see his eyes again. I couldn't believe that I like his hair better in a mohawk then long and in his eyes. The Porters came to see us for Thanksgiving. We both surprised our kids, their kids found out when they arrived at the airport and our kids found out when we picked them up at the airport. It was such a fun visit. We had a great time at the beach and boy did we eat. (We had 6 pineapples in a week!) I probably gained 20 pounds that week. 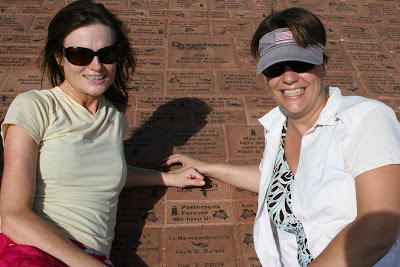 This is Kristi and I (looking beautiful on the way to the beach) at the lighthouse where we surprised them with our Porterson brick. This is the newest member of the Peterson family. Ralphie is a very sweet dog. We have really enjoyed having him here. Now I just have to convince him to stop licking my toes!!! Thanks for strolling down memory lane with me! I hope you have a Happy New Year! It has been so hot! It is so hard to believe that it is Christmas. Oh how I am dreaming of a White Christmas! So today I went to the local coffee shop and I ordered a hot chocolate. Then I sat in my car with the air conditioning on high so that it was freezing and I closed my eyes and imagined snow. I just wanted to take 5 seconds to list the things I am most grateful for! I know you are tired of seeing "Tears at Scripture Time." (That is if you even still check my blog for updates - If you are seeing this, thanks for not giving up on me.) It has been a crazy couple of months and I seem to have a hard time finding time to sit at the computer. However, since this is my only form of journaling, I suppose I should at least attempt to catch up once in a while. Life here is good. We are just finishing soccer season, HOORAY! I always love it when soccer starts and I love it even more when it ends. It has been a good year. All three boys played on different teams and it has been a really positive experience. Jeffrey played U12 and even though he is more academic than athletic, he had fun. Jackson had a fabulous coach (Jeff) and they had a lot of fun. Kevin's coack is Brazilian and calls his the White-Brazilian-Goalie. Seminary is good, it still consumes a huge part of our lives but we love it. The youth of this generation are amazing, they face temptations that I can't even imagine. I am doing pretty good. I have been struggling a lot lately with my depression. But I feel like Heavely Father is really trying to teach me something and I know that I need to be patient and learn to depend on Him more. I am missing the fall like crazy now. I want to see fall leaves and put on jeans and a sweatshirt. Instead, I will put on some shorts, turn on the fan, pray for a breeze and pretend that GREEN isn't driving me insane! Jeff and I were able to go to the "Hoedown For Hope", a fundraiser for the American Cancer Society, a few weeks ago. It was so much fun. That boy is H-O-T in a cowboy hat! 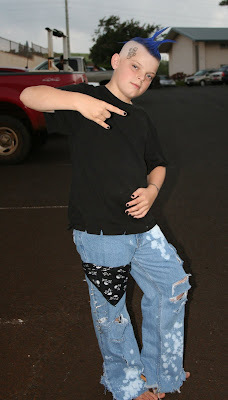 I am a crazy little kid trying to figure out how to make the world a better place.